Rosehips are cultivated from wild roses after the blooms have wilted. 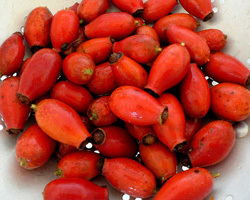 This is when the red fruits known as rosehips are produced. Believe it or not, rosehips are one of the best sources of vitamin C. In fact, they contain 50% more vitamin C than oranges even! Noting this, it’s no wonder why rosehips are very sour in flavor. These unique fruits can be used to make jams and jellies, though many people who are looking to partake in the benefits of rosehips find that it is most convenient to do so when rosehips have been brewed into a warm tea. Aside from being high in vitamin C content, a single cup of rosehips tea also contains fruit acids and pectin. There is also a good amount of vitamin A to be found in this tea which can be excellent if you’re looking for a natural way to tone and strengthen your skin. Furthermore, you can find a vast variety of different antioxidants in rosehips tea, which can help prevent damage dealt by free radicals in the body. Additionally you’ll find amounts of vitamins D, E, K, and minerals such as calcium, iron, silicon, selenium, sodium, potassium, magnesium, manganese, phosphorus, and zinc. If you’re looking for a way to calm your stomach, the acids present in rosehips tea may be able to aid digestion, though be wary to the mild laxative effects of this tea. Feelings of bloating, indigestion and an unsettled stomach may be eased with a cup of rosehips tea. 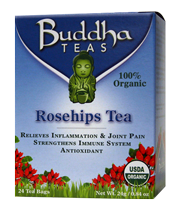 Rosehips tea has also been noted to have anti-inflammatory properties which may be useful for calming small aches and pains related to arthritis. The vitamin C present in this tea can also be useful for rheumatoid arthritis, though it is always best to consult with a doctor prior to taking herbal supplemental teas for medical conditions. You’ll find that rosehips tea is also great for its anti-viral and anti-bacterial benefits. You can drink this tea regularly to gain a little additional boost to your immune system or to cleanse your respiratory tract. The calming effects of drinking this tea may also help to brighten your mood a little as well. Support your kidneys and often neglected adrenal glands with a couple cups of rosehips tea a day. As always, consult with a doctor prior to drinking new herbal teas if you are currently pregnant, nursing, or on any medications. There are quite a few great benefits to be derived from a cup of rosehips tea. 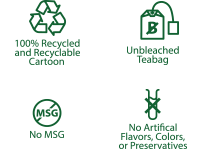 Find out more about how rosehips tea can help you.